We are glad to announce the 5th International Conference on Nanomaterials and Advanced Energy Storage Systems (INESS-2017) organized by the Institute of Batteries (IoB), National Laboratory Astana (NLA) and Nazarbayev University (NU) to be held on August 9-11, 2017 in Astana at Nazarbayev University (http://nu.edu.kz/eng) and cordially invite you to participate! The Conference will include a session with workshops by the Thompson Reuters and other specialists. Full length papers presented at the Conference will be published as Proceedings in an international journal. The researchers from different countries will participate and share their vision on progress and problems in materials science, nanotechnologies, ecology, renewable energy and energy storage systems. INESS-2017 will be supported by several TV, newspaper and internet companies. INESS-2017 is an open event and the participants from academia, industry and investors sectors are welcome to participate. We expect participation of several partner companies, and investors. The INESS conference started in Nazarbayev University, Kazakhstan in 2013. The scientists and students from Japan, Korea, France, China, Russia, Canada, UAE, UK, Turkey and Kazakhstan reviewed and discussed the recent progress and problems in materials science, nanotechnologies, ecology, renewable energy, energy storage systems and modeling methods in these fields. Looking forward to seeing you at INESS-2017! One of the favorite places and entertainments of EXPO-2017 is the stand where the Interactive Kazakhstan Energy Game “Towards a Green Economy" is presented. The exposition is a game that allows the user to create not just his own plan for the development of Kazakhstan's energy system until 2030, but also to see how effective this plan is, both economically and environmentally. The developers of the unique game are researchers from the Laboratory of Energy, Ecology and Climate of National Laboratory Astana. According to Nurkhat Zhakiyev , reasercher, NLA, the Interactive Kazakhstan Energy Game is a computer software that allows to EXPO visitors to access the power system of Kazakhstan and choose the best options for its development, including bolstering investment in electricity transmission infrastructure, facilitating fuel mix for electricity generation, integrating renewable energy and so on. The mission of this interactive Game tool is to give the full information about the current situation on the power system and Governmental targets of Kazakhstan. The project is based on an optimization model software package developed for reviewing technical and economic features of the power system. System components involve regions allowing the model to interact with these division sets through transmission lines. Also, using the data elaborated by the Kazakstani Electricity Grid Operating Company, the Game allows conducting the regional level monitoring of the spatial characteristics of the power system. All the information about each region is located on the top right side of the display. The solar and wind power technical potential is estimated with the help of data obtained from meteorological stations for each region. Industrial and residential demand data estimates indicate long-term baseline projections up to 2050. The project concept was supported by the Fund of the First President of the Republic of Kazakhstan on the basis of competition for the award for the best research in the field of science and technology for young scientists. The international seminar on antibiotic resistance was launched today in Nazarbayev University under the auspices of National Laboratory Astana and International Science and Technology Center (ISTC)/ The seminar is dedicated to the use of antibiotics in the treatment of people, including children. Scientists from Europe, USA, India, Japan, Israel, Russia, Georgia, Armenia and Kyrgyzstan, as well as Kazakstani researchers and practitioners take part in the seminar. According to Zhaxybay Zhumadilov, Director General of National Laboratory Astana, the widespread antibiotic resistance around the world became a serious danger that is manifested today in every region of the world and begins to have a negative impact on man’s health regardless of age and origin. Global collective action to address this threat includes proposals for the preparation of international treaties on antimicrobial resistance, as well as coordination in government agencies in health, food safety, veterinary and environmental protection. It is expected that within two days scientists will highlight in their work the reasons for resistance to drugs in the population of people and the spread of resistant strains between humans and animals. In addition, alternative treatments data will be made public, as despite calls for new types of antibiotic therapy, new drugs are being developed less. Researchers from the U.S. will talk about national and international programs to monitor the threats to drug resistance. National Laboratory Astana, Nazarbayev University and the International Science and Technology Center (ISTC) conduct preparatory works for the organization of Antibiotic Resistant Strains workshop that will be held on June 21 – 22, 2017 in Astana, Kazakhstan. More than 20 scientists from different countries (USA, Italy, Sweden, Japan, Israel, Armenia, Kyrgyzstan, Georgia and Kazakhstan) will come together to discuss several aspects of antibiotic resistance (ABR): on molecular methods of studying antibiotic resistance strains, on the problem of antibiotic resistance in pediatrics, alternative ways of antibiotic use, and influence of antibiotic resistance to society and environment. Maxsat Zhabagin, researcher, Laboratory For Population Genetics, NLA in cooperation with Oleg Balanovsky, Elena Balanovska, Zhaxylyk Sabitov, Marina Kuznetsova, and others published a new study in Scientific Reports 7, article number: 3085(2017). Authors have analyzed Y-chromosomal variation in populations from Transoxiana, a historical region covering the southwestern part of Central Asia. They studied 780 samples from 10 regional populations of Kazakhs, Uzbeks, Turkmens, Dungans, and Karakalpaks using 35 SNP and 17 STR markers. Analysis of haplogroup frequencies using multidimensional scaling and principal component plots, supported by an analysis of molecular variance, showed that the geographic landscape of Transoxiana, despite its distinctiveness and diversity (deserts, fertile river basins, foothills and plains) had no strong influence on the genetic landscape. The main factor structuring the gene pool was the mode of subsistence: settled agriculture or nomadic pastoralism. Investigation of STR-based clusters of haplotypes and their ages revealed that cultural and demic expansions of Transoxiana were not closely connected with each other. The Arab cultural expansion introduced Islam to the region but did not leave a significant mark on the pool of paternal lineages. The Mongol expansion, in contrast, had enormous demic success, but did not impact cultural elements like language and religion. The genealogy of Muslim missionaries within the settled agricultural communities of Transoxiana was based on spiritual succession passed from teacher to disciple. However, among Transoxianan nomads, spiritual and biological succession became merged, leading to the formation of haplotype mini-clusters among nomadic clergy. NLA to open joint Laboratory on Medicine in Shanghai, China. 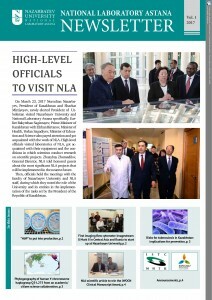 National Laboratory Astana and Tongren Hospital in Shanghai, China, which is a major research medical center of the city, will open a joint international Laboratory on Medicine, where different studies of gastrointestinal tract tumors, diseases of neurology, cardiovascular system will be conducted, as well as issues related to aging and diseases associated with aging processes. According to Professor Zhaxybay Zhumadilov, Director General of National Laboratory Astana, who took direct part in all the negotiations with Chinese colleagues, the starting of a joint Kazakh-Chinese project is a mutually beneficial cooperation for both sides, and it will be very helpful for scientists to exchange experience and knowledge more quickly in solving the most important problems of medicine . Dear visitor, read our 2017 NLA newsletter! The scientific paper A Comprehensive Review on Current Status of Topical Odor Controlling Therapies for Chronic Wounds which has been published in the Journal of Wound Ostomy & Continence Nursing has won a prize of this journal JWOCN Clinical Manuscript Award. The authors of this paper are NLA researchers: Talgat Nurgozhin, Director, Center for Life Sciences, Timur Saliyev, Head of Laboratory of Translational Medicine and Life Sciences Technologies, NLA, and Alma Akhmetova, Junior researcher, NLA. The prize will be given at the Conference of Wound, Ostomy and Continence Nurses Society, which will be held on May, 2017 at Calvin L. Rampton Salt Palace Convention Center in Salt Lake City, Utah, USA. In this study our researchers analyzed the process of wound healing, which is often accompanied by bacterial infection or critical colonization, resulting in protracted inflammation, delayed reepithelization, and production of pungent odors. The malodor produced by these wounds may lower health-related quality of life and produce psychological discomfort and social isolation. Current management focuses on reducing bacterial activity within the wound site and absorbing malodorous gases. For example, charcoal-based materials have been incorporated into dressing for direct adsorption of the responsible gases. In addition, multiple topical agents, including silver, iodine, honey, sugar, and essential oils, have been suggested for incorporation into dressings in an attempt to control the underlying bacterial infection. This review described options for controlling malodor in chronic wounds, the benefits and drawbacks of each topical agent, and their mode of action. Authors also discussed the use of subjective odor evaluation techniques to assess the efficacy of odor-controlling therapies. The perspectives of employing novel biomaterials and technologies for wound odor management were also presented. Maxsat Zhabagin, researcher, Laboratory For Population Genetics, NLA in cooperation with well-known scientists Oleg Balanovsky, Rebecah Canada, Nadia Al-Zahery and others published a new study in BMC Evolutionary Biology (IF 3,6) on the potential of full Y-chromosome sequencing for reconstructing haplogroup Q3 phylogeography. Researchers analyzed 47 fully sequenced Y-chromosomes and reconstructed the haplogroup Q3 phylogenetic tree in detail. Haplogroup Q3-L275, derived from the oldest known split within Eurasian/American haplogroup Q, most likely occurred in West or Central Asia in the Upper Paleolithic period. During the Mesolithic and Neolithic epochs, Q3 remained a minor component of the West Asian Y-chromosome pool and gave rise to five branches (Q3a to Q3e), which spread across West, Central and parts of South Asia. Around 3–4 millennia ago (Bronze Age), the Q3a branch underwent a rapid expansion, splitting into seven branches, some of which entered Europe. One of these branches, Q3a1, was acquired by a population ancestral to Ashkenazi Jews and grew within this population during the 1st millennium AD, reaching up to 5% in present day Ashkenazi. This study dataset was generated by a massive Y-chromosome genotyping effort in the genetic genealogy community, and phylogeographic patterns were revealed by a collaboration of population geneticists and genetic genealogists. This positive experience of collaboration between academic and citizen science provides a model for further joint projects. Merging data and skills of academic and citizen science promises to combine, respectively, quality and quantity, generalization and specialization, and achieve a well-balanced and careful interpretation of the paternal-side history of human populations. Zhaxybay Zhumadilov, General Director, NLA and Saule Rakimova, Leading researcher, NLA published their new research on tuberculosis in Kazakhstan in the International Journal of Tuberculosis and Lung Disease in cooperation with scientists from Columbia University, New York, USA, Columbia University Global Health Research Center of Central Asia, Almaty, Kazakhstan and National Center for Tuberculosis, Almaty, Kazakhstan. The objective of the study was to examine associations between incarceration history and tobacco, alcohol, and drug consumption, and human immunodeficiency virus (HIV) infection and diabetes mellitus (DM) with TB. This matched case-control study included 1600 participants who completed a survey on sociodemographics, history of incarceration, tobacco, alcohol and drug use, and HIV and DM diagnosis. Conditional logistic regression analysis was used to examine associations between a TB diagnosis and risk factors. Participants who had ever smoked tobacco (aOR 1.73, 95%CI 1.23–2.43, P  0.01), ever drank alcohol (aOR 1.41, 95%CI 1.03–1.93, P  0.05), were HIV-positive (aOR 36.37, 95%CI 2.05–646.13, P  0.05) or had DM (aOR 13.96, 95%CI 6.37–30.56, P  0.01) were more likely to have TB. The association between TB and tobacco use, alcohol use, HIV and DM in Kazakhstan suggests a need for comprehensive intervention and prevention approaches that also address tobacco and alcohol use, DM and HIV. The International Journal of Tuberculosis and Lung Disease (IF 2.148) publishes articles on all aspects of lung health, including public health-related issues such as training programs, cost-benefit analysis, legislation, epidemiology, intervention studies and health systems research. The IJTLD is dedicated to the continuing education of physicians and health personnel and the dissemination of information on tuberculosis and lung health world-wide. Certain IJTLD articles are selected for translation into French, Spanish, Chinese or Russian.